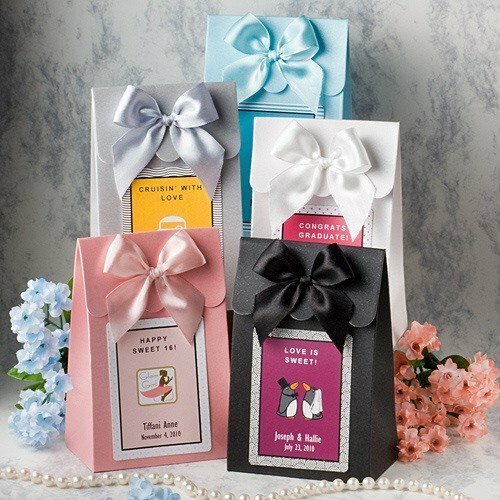 Filled with chocolates, soap, candles, lottery tickets or homemade goodies, these personalized gift boxes are a treat on the inside and the outside! 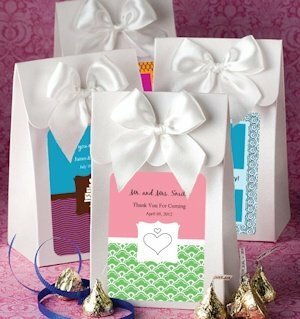 Each 5 3/4" by 3 1/2" folded favor box is 2 1/4" deep with a fluted flap top and matching white bow. The white iridescent finish features a front center area designed for a personalized label that you create during the checkout process. Our labels are a blank canvas where you can choose the border color and design, background color, design image and 3 lines of custom text. When the favor boxes arrive you will have to adhere each self-stick label to the front. 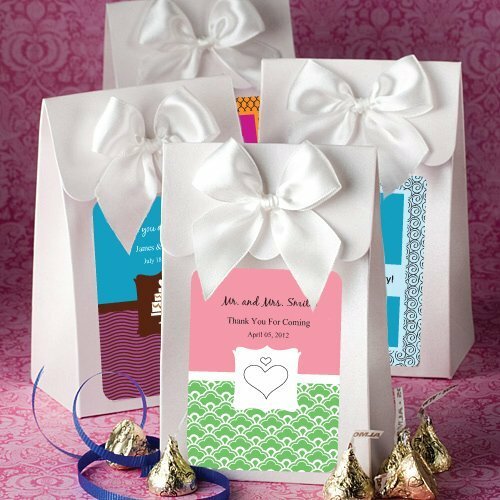 From bridal showers to sweet 16 parties to wedding receptions, our favor boxes are designed to fit in wherever you need them! Boxes measure 5 3/4" by 3 1/2" folded favor box is 2 1/4" deep with a fluted flap top and matching white bow. Assembly required to assemble box, attached personalized stickers and attach bows.